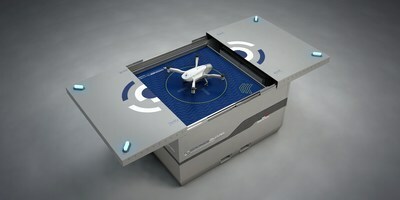 Azur Drones, European leader in surveillance UAVs, has just received the first and only DGAC approval for a fully-automated drone - Skeyetech system - which takes off from a docking station and requires no remote pilot. This specific approval is unprecedented since any authorized flight scenario in France requires a qualified pilot. "We are very proud of this approval which rewards an 18-month close collaboration with DGAC services. Our system had to comply with the civilian aviation authorities' requirements in terms of safety, reliability and quality. A process that was obviously very demanding due to the fully automated character of our system," explains Stéphane Morelli, Azur Drones Managing Director. "This unprecedented approval is a landmark event for professional civil drone," adds Jean-Marc Crépin, Azur Drones CEO. "Azur Drones unlocks huge markets that are currently restrained by the complexity of common drone solutions implementation. Unlike standard piloted solutions, our systems are easy-to-use, operational 24/7, precise and reliable."